After every quarter I delve into our customer service data to have a look at a few things: first (and foremost) are we effectively meeting out goal of providing world-class customer service to our community? Next, what is the demand on our system and do we have capacity available to meet it? Third, have we improved our performance across the key metrics of speed, quality, and efficiency? We offer customer service through a number of channels: email, chat, social media, and phone and we collect and analyze the data from each of these channels. Email is, by far, our most important method for delivering service and over the past 4 1/2 years we have become adept at handling the volume as it has increased. The average time to respond to a new request via email has dropped from an average of almost 17 hours back in September of 2008 to an average of 4.6 hours last month; the time to answer a customers question or resolve their issue (measured by the average “solve time,” or the number of hours that a request is “open”) has been reduced from almost 125 hours 4 years ago, to under 21 hours last month! In addition to increased capacity, we have also been able to consistently improve our performance through the use of customizable software tools, a clear understanding of the kinds of problems that typically arise, the ability to spot trending issues or problems, and the ongoing professional development of our team members. The metrics I mention above are just that – metrics. Of even greater importance to us is the quality of the support we deliver. Of course we have our share of angry and unhappy customers and we work very hard to help those folks. But the simple truth is that some folks will never be satisfied with the service your company can provide. But understanding your customer’s perceptions of your service is critical. We track this in a number of ways, but the best way is also the simplest. When a support ticket is closed we always send that customer a very simple 1-question survey: “How was the quality of the customer support you received?” The survey is a way for us to get a snapshot of satisfaction at any given time. The satisfaction rating we received last month? 94.41% So far in October we are running at 94.5%! Our goal at all times is to push that number to 100%; we’re still trying. This post will focus specifically on our phone support channel. We started experimenting with phone support last year – first for Buyers only and on a limited number of pages. Initially we offered phone support for a limited number of hours per day and had one person who handled the small number of calls generated; as we got better at it and started implementing new tools, we slowly added more pages where the phone number was displayed and increased the number of hours it would be available. This past Spring, we introduced the phone number sitewide, made it available to all of our users, and increased the hours to 8am-6pm CT. The response has been overwhelmingly positive and we have quickly become adept at managing the process, training our agents, routing the calls, and handling an increasing volume of calls. We started using new software to help us with this and now our agents (many of whom work remote from HQ) answer incoming calls via laptop and headset anywhere they have an Internet connection. With phone support, it is important to understand the day of the week and the time of day that customers call us. Answering phones can be exhausting work; customer problems, emotional outbursts, impatient users, and increasing volume can all add to the stress that a phone support agent myst deal with. Scheduling is critical and this data allows us to schedule efficiently and effectively. In our case, we try to always have 2-3 agents handling calls during peak hours; this allows an agent to find some relief from the stress and assures that they are supported by the entire customer service team. In fact, all of our phone agents also handle email requests as well as chat sessions to relieve the pressure that comes with answering phones. 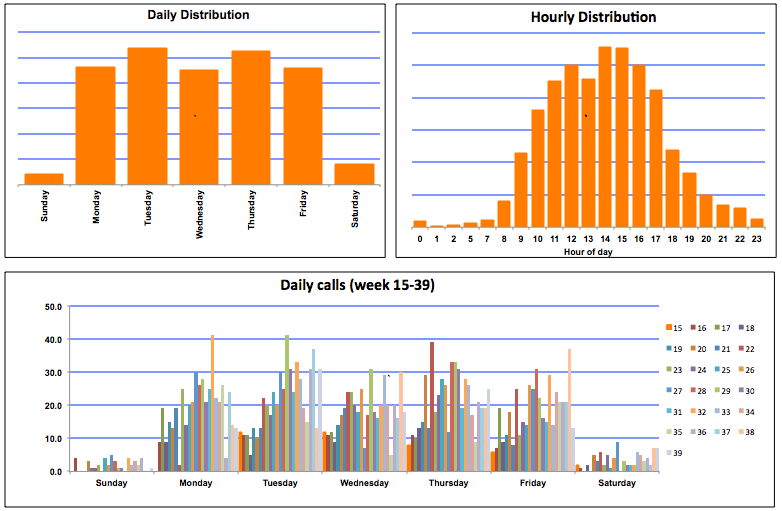 These first two charts below show daily and hourly distribution of incoming calls, while the third shows how daily call volume has increased week-over-week since we started displaying our phone number across the site. Not just how many, but how long. As in minutes. Our agents have quickly learned that some folks just like to chit-chat, others have TONS of questions, and still others need remedial training in basic computer skills. These customers necessarily talk longer and necessarily require greater capacity on our part. But knowing this informs our approach and helps us to deliver better service on the phone. For instance, we never limit the time needed to help a customer; a call can take 30 seconds or 30 minutes and our agents are trained to not rush callers. In fact, it is our policy to not set time limits on calls or even have targets. We do track the average call time for each of our agents, but not for performance review, but rather to get a feel for different styles of communication with our callers. 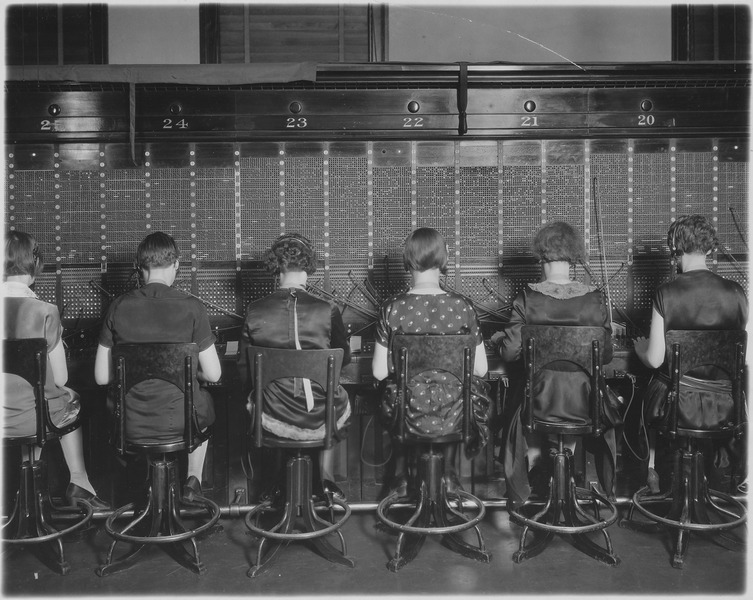 Interestingly, there is very little difference on average call time between our agents who handle calls. This is difficult to measure empirically and we have identified some data which helps us to answer this question. One way to gauge improvement, and indeed to improve, is simply to listen. Eavesdropping (even though Mom told me it wasn’t polite) provides a great opportunity for qualitative improvement when combined with meaningful review. Managers need to spend time observing phone support agents, listening critically, and providing ongoing feedback to help agents improve their skills and communication abilities. Beyond that, look at more empirical, quantitative data that might help: “How many calls go unanswered?” “How long is our average hold time?” “Is our capacity/coverage appropriate to the demand?” Answering questions like these, both empirical and subjective, can help you to find ways to constantly and consistently improve!